Reducing trade costs is essential for economies to effectively use trade as an engine of growth and sustainable development. Trade facilitation plays a pivotal role in reducing trade costs, on top of existing efforts to dismantle tariff and non-tariff barriers and enhance physical connectivity. In the Asia–Pacific Trade and Investment Report 2017, the United Nations (UN) Economic and Social Commission for Asia and the Pacific (ESCAP) found that moderate region-wide improvements in trade facilitation in Asia and the Pacific could lift gross domestic product (GDP) by 0.32% annually between 2015 and 2030, which is equivalent to nearly $87 billion per year—14 times more than under the tariff liberalization scenario considered in the same study. In addition, if bigger and more ambitious steps are made in putting all the Asia-Pacific region’s trade-related paperwork online, digital trade facilitation could slash the time it takes to export goods by up to 44%, cut the cost of doing so by up to 31%, and boost exports by as much as $257 billion a year. Trade facilitation and the digitalization of trade procedures have taken increasing importance as evidenced by the implementation of the World Trade Organization’s (WTO) Trade Facilitation Agreement (TFA). Regional and subregional initiatives to facilitate the electronic exchange of information along international supply chains have also grown in numbers, such as the Framework Agreement on Facilitation of Cross-Border Paperless Trade in Asia and the Pacific (Framework Agreement). 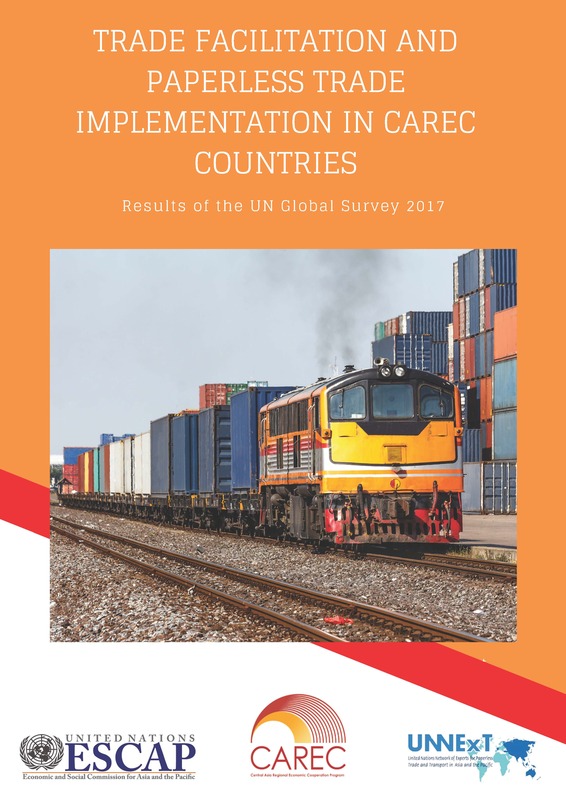 This report presents an analysis of the results of the UN Global Survey on Trade Facilitation and Paperless Trade Implementation (Global Survey) for nine members of the Central Asia Regional Economic Cooperation (CAREC) Program. Conducted between January and July 2017, the Global Survey provides information on the implementation of selected measures under the TFA and of innovative, technology-driven measures that enable trade using electronic rather than paper-based data and documentation - otherwise referred to as “paperless trade”. The 2017 Global Survey also covers specific trade facilitation measures targeted for small and medium enterprises (SMEs), the agriculture sector, and women. The Asian Development Bank (ADB)-commissioned assessment conducted in 2017 provides examples and additional information on CAREC countries. The ADB assessment ascertained the extent to which CAREC countries were ready to implement the WTO TFA.